Dedicated to racks & pinions drive applications, the DRP+ design is based on the association of two top quality planetary reducers, mounted in parallel on an extra high stiffness universal frame. 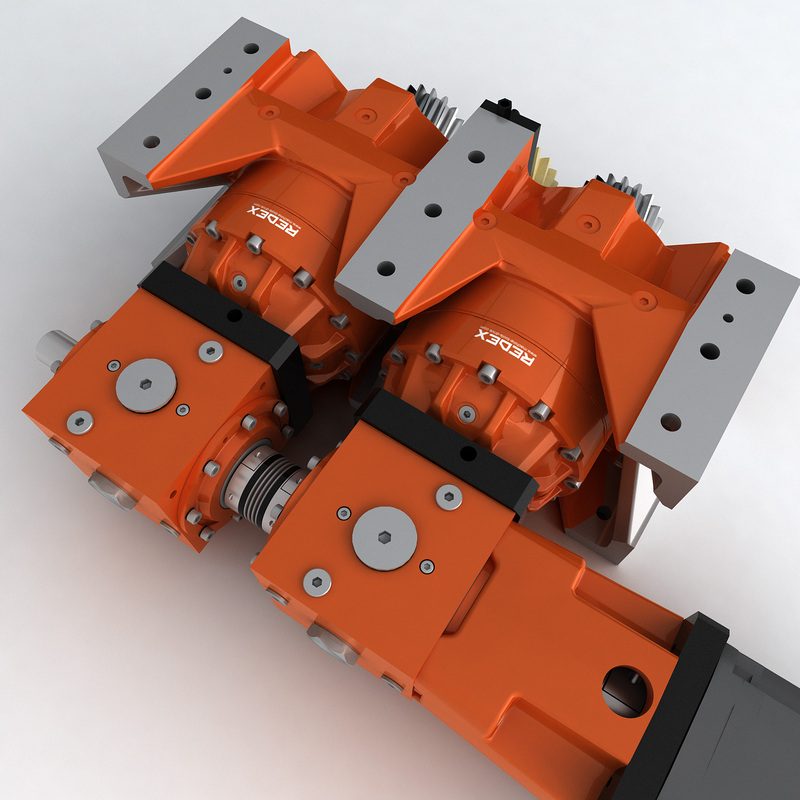 When choosing the mechanical preload solution, the DRP+ become aDualDRIVE unit, which achieve the true backlash free feature by torsionally winding one pinion against the other through the rack. Immediate benefits are to need only one motor, and to dramatically simplify the motor control. When choosing the Electrical preload solution, the DRP+ is used as a TwinDRIVEunit, where the backlash is cancelled by the opposite torque balance between the two pinions, according with the two motors and drives remote control. 6 Sizes. Reduction ratio : 21 to 91. Acceleration up to : 25 m/s2. Nominal tangent load (V2=60m/min) : up to 108 000 N.
Max axis weight (for just one Dual Drive) : up to 62 000 kg. Dedicated to racks & pinions drive applications, the KRP+ design is based either on the use of one single unit or on the association of two top quality planetary reducers, mounted in parallel on the machine main frame. 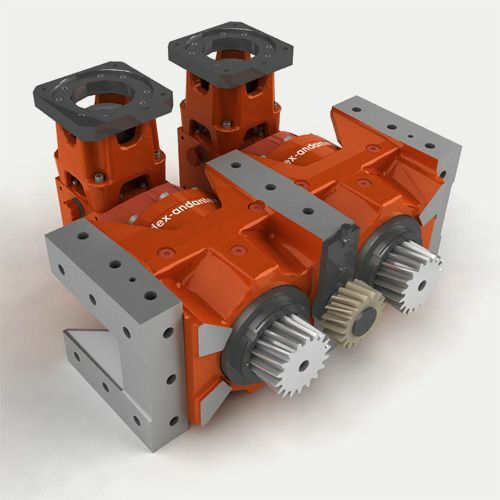 When used as a SingleDRIVE, the KRP+ gives the benefit of an ultra high stiffness feed gearbox, dedicated to high performances rack & pinions drive systems. When choosing the mechanical preload solution, the KRP+ become aDualDRIVE unit, which achieve the true backlash free feature by torsionally winding one pinion against the other through the rack. Immediate benefits are to need only one motor, and to dramatically simplify the motor control. 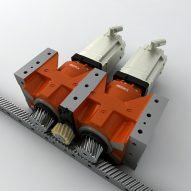 When choosing the Electrical preload solution, the KRP+ is used as a TwinDRIVEunit, where the backlash is cancelled by the opposite torque balance between the two pinions, according with the two motors and drives remote control. Low inertia driving system. 6 Sizes. Reduction ratio : 21 to 91. Max axis weight : up to 62 000 kg. The new benchmark for electrical preload on demanding machine tool applications! 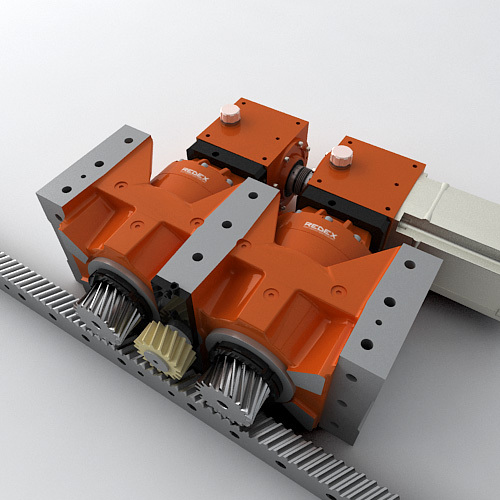 KRPX is the new version of REDEX ANDANTEX rack & pinion high-tech planetary reducers, offering cost effective, easy to implement and high performing solutions for moving column or gantry machine types as well as many other applications. The KRPX housing is made of high quality spheroidal graphite cast iron. Its structure has been optimised with FEM analysis methods to avoid deflection during acceleration. 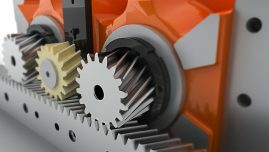 Connection to the machine is made by oversized screws therefore ensuring a solid connection with the machine frame. 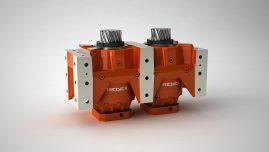 This allows the KRPX housings to be considered an integrated part of the machine main frame. The output pinions are machined to the same diameter as the shafts, allowing the best possible balance between transmissible torque and rigidity at the rack. In addition, output bearing consists of two preloaded and substantially oversized angular contact roller bearings. This exclusive design offers exceptional compound stiffness which allows to dramatically decrease the radial bending (up to 60% of the overall distortion) and to increase the natural frequencies of the global Racks & Pinions drive systems. Designed as a combination of two high-tech planetary reducers, KRPX allows perfect mounting on both sides of the machine frame and enables true zero backlash when coupled with an electrical preload system. Available in 3 standard universal sizes (2, 3 and 4) KRPX is very compact, a definitive advantage for helping implementation with respective pinion height not higher than 104, 127 and 148 mm. SRP is not one more simple planetary gearbox but a true integrated concept, including several functions combined together to offer a complete sub-assembly to the most demanding machines.